Are all Native Americans descended from the Clovis people? For the very first time, scientists have produced genetic evidence that today's indigenous North and South Americans are all descended from a single population that trekked across the Bering land bridge from Asia. 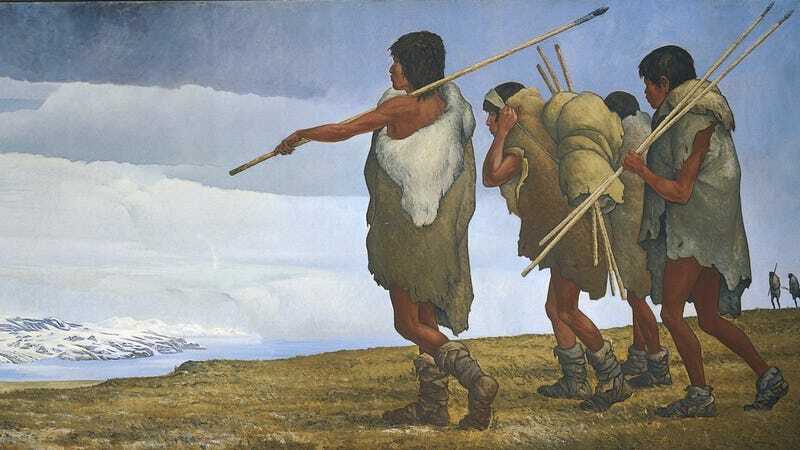 For the past 20 years, anthropologists have argued over whether the first Americans came to the New World by walking over a land bridge across the Bering Strait, or by sea from southwest Europe (the so-called the Solutrean hypothesis). A genetic analysis of a one-year-old Late Pleistocene human from a Clovis burial site in western Montana may have settled the issue once and for all. The 12,600 year-old skeleton — which the anthropologists are now calling the "missing link" — was accidentally uncovered by construction workers in 1968. According to the study's authors, some 80% of all present-day native populations in North and South America are direct descendants of the Clovis boy's family, and the remaining 20% are still more closely related to the Clovis family than any other people on the planet. Image of Clovis stone points by Robert L. Walker. The genetic analysis found that the boy is less closely related to Cree, Algonquin, and Ojibwa Native Americans in Canada than to the Maya of Central America and the Karitiana of Brazil. That can best be explained, the scientists say, if he belonged to a population that is directly ancestral to the South American tribes. The most likely scenario, said Texas's Raff, is that humans reached eastern Beringia from Siberia 26,000 to 18,000 years ago. By 17,000 years ago, receding glaciers allowed them to cross the Bering Strait. Some migrated down the Pacific coast, reaching Monte Verde in Chile by 14,600 years ago, while others - including the ancestors of Anzick-1 - headed for the interior of North America. Today's Native Americans are "direct descendants of the people who made and used Clovis tools and buried this child," the scientists wrote. "In agreement with previous archaeological and genetic studies, our genome analysis refutes the possibility that Clovis originated via a European migration to the Americas." All this being said, many experts are not convinced, including Oxford University geneticist Stephen Oppenheimer. "They haven't produced evidence to refute the Solutrean hypothesis," he is quoted in the CBC article. "In fact, there is genetic evidence that only the Solutrean hypothesis explains." Much more at the CBC. Read the entire study here, plus a Nature News commentary on the ethics of the finding. Top image: DEA Picture Library/De Agostini/Getty Images.